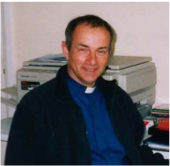 The Reverend Michael Brock, ex vicar of Oxton, Epperstone and Gonalston and Diocesan Rural Advisor. “It was November 1990 [when] we moved here, starting at Oxton a few weeks later”. “Bestwood Village was one of the parishes I was [previously] responsible for. And one of the interesting things I found was that amongst the old miners, the Church was regarded as being the preserve of the owners of the mine, so there was quite a clear social divide and as far as they were concerned the Church was for other people, not them. The only time we got them to Church was funerals, sadly. So there is a huge contrast between Oxton and Bestwood Village, not just in the sort of nature of the people who live there but also the way that they are employed. Obviously some folk in Oxton are still employed by the estate on the land, not so many now, but a lot of them now are professional people coming in, like teachers, shop managers, very different backgrounds”. “The folk who move in don’t have that network of family and friends in an around Oxton so when they need to move on because their jobs change or their circumstances change, there isn’t that network that they’ve got to leave behind. Whereas for the older folk to even think of moving out of Oxton is just out of the question because it’s not just their home it’s the whole family social circle that they have developed over decades that they will be leaving behind and there’s no reason to leave it behind because I think the vast majority of the old Oxtonians are very happy in Oxton”. “My work as Diocesan Rural Advisor is really in two parts. Part of my job is to support, encourage, train rural Clergy in the task of rural ministry. Many of them, like me, come from urban backgrounds and they quickly discover that life in the country is very different from life in the town. or life in the city. But the other aspect of my job is to advise the Diocese, the Bishops, Archdeacons, the various boards and committees about rural issues. Obviously the topical one over the past four or five months has been the outbreak of foot and mouth and the impact that has had on the farming industry and the farming community”. ” A priest usually living within the parish has been a reality for well over a thousand years and, the symbol of the Priest is very much an important part of it. It still amazes me how powerful that is in the life of a community, it’s almost as though villages were like a tribe and they need their sacred places, they need their sacred persons or parsons. I mean it’s a very stable part of community life, the parish Church is still in the landscape pictures of England a very powerful presence, a very powerful symbolic presence”. “Oxton is quite a wealthy Church in the grand scheme of things, but I do think that’s because [there is] a very good relationship between the Church and the village. The family services are very well attended, we are touching many of the families that live in the village through Sunday School, Pathfinders, Family Services. We have a good relationship with many of the other members of the community. I think it’s true to say that many folk in the Oxton village do respect the Church and appreciate the contribution it makes and therefore they have been generous in its support. I think people appreciate the Church through baptisms, weddings and funerals. Most people still want to celebrate the great festivals of Easter, Christmas, Harvest. So as long as we continue to be outward looking I have no fears about the future of Oxton Church”. “It’s amazing how many old names keep on cropping up, not just in the deaths register but also in the baptismal register and in the wedding registers so there is a continuity within the village. With certain names, we could think of the Strutts, Brambles and those kinds of old village names that have been here well over a hundred years. The fascinating thing is that I think the majority of people who die in Oxton are still being buried in the Church yard which is very unusual because nationally I think it’s less than twenty per cent. So the registers do provide an interesting, almost objective picture of what has been happening in the village, about who’s been here and who’s been married and who’s died and who’s had children. Again as you know, often the older families like to come back for the baptisms, the weddings. I still get quite a few requests from families who’ve grown up in the village, and they want their children baptised in the Church where they grew up, or when they want to get married they still want to come back to Oxton to get married in the parish Church where they may have sung in the choir, where they may well have been baptised, where their grandparents may be buried. So these sort of long term community trends do still shape our lives. If you look in the old burial registers it would often say labourer or farm worker or game keeper, you know the jobs associated with the land, or a carter, wheelwright, whatever, even a cooper, but obviously nowadays it’s very different, they’re doctors, nurses, teachers, accountants and so on”. “For a number of years, with the desirability of places like Oxton, the price of housing has risen enormously. We all know that the new development opposite the Church, the so called starter homes, the joke was that that the starting price was over a hundred thousand pounds. Now the vast majority of people in their twenties cannot afford that kind of price so there’s no way that children who’ve grown up in the village will be able to afford to continue to live in Oxton. I think that’s the great sadness, it deprives the community of their energy, their enthusiasm. We miss a generation. Many folk have moved out to Blidworth, Calverton, Nottingham and so on because the housing there is cheaper”. “It’s a subtle balance; obviously religion is a very serious business but also being humble and humorous is also very important. This ability to laugh at yourself, not take yourself too seriously is one of the most important aspects of being human. One of the funniest times was when I called a bride by her mother’s name and the congregation burst into fits of laughter. Fortunately I knew the family very well and they took it in good heart and they thought it was very funny as well but you know it’s not the sort of thing they’re going to sue you over, well I hope they’re not! I hope that we never take religion too seriously because you know how disastrous it is when religion is taken seriously. We fall out in a major way and you’ve only got to look at Northern Ireland or the Middle East. I think humour and humility are very important parts of Christian life”. 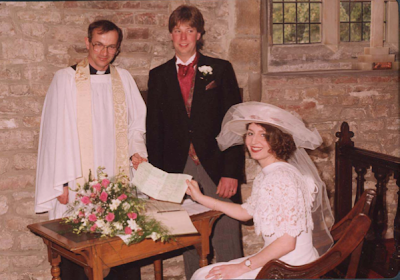 Wedding of David and Suzanne Redfern with Reverend Michael Brock Oxton Church 20th April 1996.